Identity. We all struggle with it at some level. As Christians, most of us have a really hard time understanding our identity as royalty. The whole idea of God being the King of Kings and us being Princes and Princesses is a little, well, hard to grasp for some. It’s a lot easier to understand being a child, a warrior, a bride, or even being a servant. But being royalty? There’s little in our daily living that helps us understand realities of Kingship. We’re born into a messed up world that doesn’t always set us up for success. Like Rapunzel, some of us have been used and abused, lied to about who we are, or torn away from the truth and raised under false precepts. Moment of Truth? Not quite yet. Sometimes, before we know who we are, life grants us these little glimpses of truth. Sometimes, those glimpses don’t last long, but they are key points in the process of discovery. 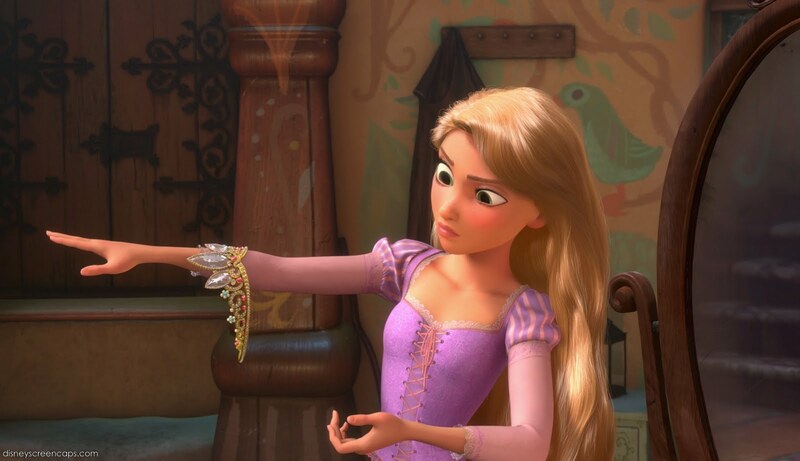 Usually, the lies we’ve believed for so long slam us right back down into our deception which tells us “that was a stupid, ridiculous thought.” Like Rapunzel as she put on the crown, we’ll shake our heads like “no, that couldn’t be right.” If we’re truthful, we really liked how it looked on us. The crown even seemed to fit just right. But, me? I’d never be worthy enough. Like Rapunzel, the key to understanding our identity is knowing to whom we belong. We belong the King. They don’t tell us a lot about the King in the movie ‘Tangled,’ but they tell us enough. He was a good King, and he loved his family. 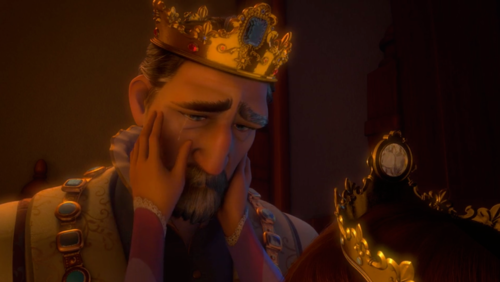 From the beginning, while Rapunzel was locked up in the tower, the King was on a relentless pursuit of his lost daughter. He sent the best of His Kingdom warriors searching after her. 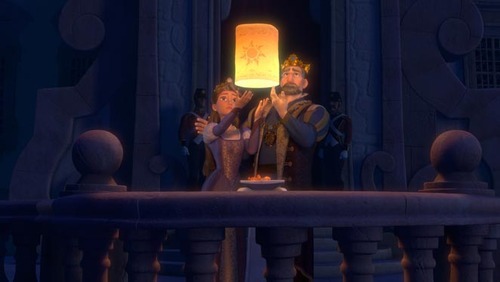 Every year on her birthday, he had the entire Kingdom light lanterns and send them out into the night. 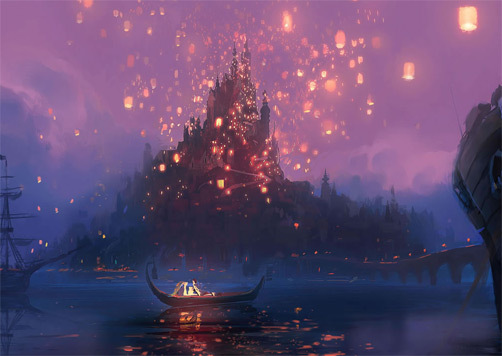 The lanterns were a celebration of her birth, and so after she was taken by the enemy, they became a beacon of hope that she would someday return. He wept over her being stolen away from him, and he never gave up hope that she would someday be found. Our Father, the King of Kings, does the same thing for each of His children that are lost. He weeps over them! In ways specific for each person, God releases His “light” into the darkness so each will be drawn closer to Him. Christ is the light that draws people to the Father! God has sent his Kingdom warriors throughout the world to be a beacon of hope to His children who still haven’t found their way back home. I also like Rapunzel’s story because it shows she’s a Princess by inheritance of who her dad is, and NOT because a prince came and rescued her. Although I love those stories too, and they have their place in my parables via Disney, I love that this is the story of the love of the Father. 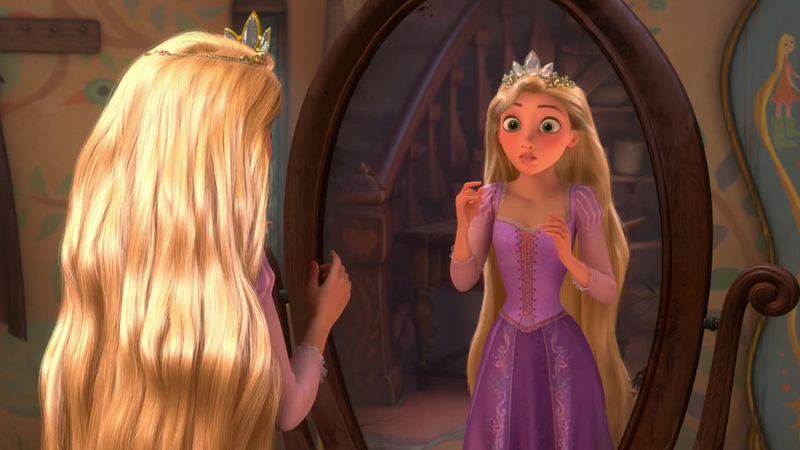 Remember that moment when Rapunzel makes her way into the Kingdom for the first time? Rapunzel finds herself in the middle of the courtyard and she begins to dance. One by one, she drags people to the dance floor. It’s one of my favorite moments. Why? Because she’s finally living as she was born to live! There’s this beautiful reality in motion. She’s gathering the people and bringing unity among them without ever realizing the weight of what’s going on. It’s what the Princess would have done. She doesn’t realize it because it’s natural for her. The people around her fade out as she takes in the music. Everything is perfectly in place, and there’s this inner joy that radiates on her face. For once, she’s right where she belongs. She’s living out the role of her identity as the Princess before she ever knows it! I’ve seen people in the church ignite in the same way. It’s their first moment of freedom expressed before the Lord completely unhindered. There’s usually times of worship before it happens, and obviously a lifetime of moments of worship afterwards. But there’s always this FIRST breakout moment. It’s this ridiculously crazy, beautiful, innocent, and more-real-than-anything-in-the-world moment, because someone is FINALLY living the way they were born to live! It usually seems out of place and perfectly IN place all at the same time! When a person first let’s loose in worship, and doesn’t let the fear of what people think ruin their moment of worshipping the Lord, the Holy Spirit moves in beautiful ways. Their act of worship releases a spirit of worship among the whole body of Christ! It’s one of my favorite things to experience within a body of believers. This expressive breakout moment, when you finally let love conquer the fear in your mind and heart, typically leads into the moment when you REALLY grasp God as your Daddy: the King of Kings. When you get the full picture of what it means to belong to your King Daddy, everything changes. Rapunzel had her moment. Remember when she sees it for the first time? The mural of the King and Queen holding the lost baby Princess. And she knows. Deep within herself, she knows she’s that little girl. She’s the lost Princess. I remember the moment I first realized the weight of being royalty in the Kingdom of God. It’s a lot to take in. Most people recognize the concept, but continue to live like spiritual paupers. It’s even easier to live as spiritual paupers, sometimes. But we weren’t born to live that way. The King is waiting for us to return to the place where He can hold us in His arms and dote on us. He’s waiting for us to come back to Him so we can learn the ways of the Kingdom, so eventually we can take authority and live out a purpose far greater than we ever imagined. But that FIRST moment. The moment you know in the depth of your soul you are someone of worth, of value, of greatness. The moment you GET your identity in your King Daddy, rather than the mess the world handed you. You are a daughter of the Most High God, and your desire for the light wasn’t just some fantasy. The light IS about you and FOR you and MEANT for you. You are the precious Daughter of the King. It’s a moment that changes everything.